Type I diabetes mellitus is also known as Insulin Dependent Diabetes Mellitus (IDDM). It occurs in people who suffer from insulin deficiency. Insulin is the hormone that’s responsible for lowering blood glucose levels to an acceptable range, and this hormone is secreted by the pancreas. This condition can result due to absolute or partial loss of beta cells, which are present in the pancreas and secrete insulin. A family history of early onset diabetes is usually present in people who suffer from type I diabetes mellitus. These patients also develop auto-antibodies, which are antibodies that destroy other protein cells that are essential for bodily functions. Typically, this form of diabetes occurs before the age of 25 years, often during a patient’s childhood. Individuals who suffer from this type of diabetes are treated through insulin supplements, as oral medication is of lesser use for type I diabetes mellitus patients. 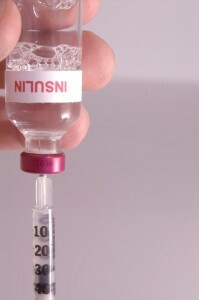 Insulin injections are essential for people who suffer from both types of diabetes. Type II diabetes mellitus was formerly known as Non-Insulin Dependent Diabetes Mellitus (NIDDM). It occurs in people whose peripheral body tissues do not utilize enough insulin, and also in people with beta cell problems (the cells that secrete insulin). This type of diabetes is associated with factors like obesity, a sedentary lifestyle that lacks exercise, and old age. An active family history of the condition also contributes to type II diabetes mellitus. Type II diabetes is a form of adult onset diabetes which generally occurs after the age of 40 years. It can appear at an earlier age, mainly in people who indulge in less physical activity. Treatment options in this type of diabetes include diet modifications (usually a low calorie diet), an exercise regimen, oral medications, and insulin supplements. Here’s a simple outline of the causes, symptoms, and treatment options of type II diabetes. Apart from the causes specified, diabetes may also result due to certain viral infections and hormonal disorders that might result due to excessive growth hormones. Both types of diabetes are dangerous, as uncontrolled diabetes may lead to complications related to the heart, kidneys, and eyes. It is essential for every individual to follow a proper diet and get regular exercise to prevent the complications of diabetes mellitus. This entry was posted in Diabetes and tagged different types of diabetes, types of diabetes mellitus by Dr. Kiran Kishore. Bookmark the permalink. Dr. Kiran Kishore (M.D., MBBS) is a Consulting Physician and Diabetologist at Srinivasa Clinic & Diabetes Care Center, Hyderabad. He also serves as the Assistant Professor at Bhaskar Medical College. Dr. Kishore specializes in Pharmacology and Diabetology, and has over six years of experience as a Diabetologist.